It's really been a tough couple of years for Blaze Bayley. The former Wolfsbane/Iron Maiden front man released a string of very strong albums under the moniker of Blaze before management issues, financial problems as well as depression and alcohol abuse started to take its toll. Things began turning around when he re-connected and eventually married his wife Debbie in Feb. 2007 after knowing each other for almost 20 years. She quickly got involved; not only managing his life but managing Blaze (the band) as well. Earlier this summer, tragedy struck when Blaze's wife suffered a serious brain hemmorhage and later a stroke in September which eventually claimed her life. After a brief period of mourning, Blaze has decided to carry on in her memory with his current project which had released this album, The Man Who Would Not Die earlier in the year. The album itself is somewhat biographical and sheds the sci-fi and futuristic subject matter of previous albums in favour of themes of determination, perseverance, survival and defiance. The whole package seems quite ironic as he now faces the very same obstacles that he deals with in the context of this album. 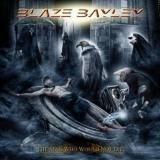 Sounding heavier and better than ever, Blaze Bayley has delivered not only one of the best albums of his career but one of the best traditional heavy metal albums of 2008 and will certainly make my years best list. Right out of the gate, the title track, The Man Who Would Not Die sets the tone for this blistering slab of heavy metal that has it's roots firmly entrenched in the long standing tradition of British Heavy Metal. Speedy tempos and thundering drums along with solid leads and thematic riff breaks are not only found on this track, but many others as well. The steamroller continues with Blackmailer; a track that features solid pull-off type riffs and more double bass fuelled thundering heaviness. This one (and a few others) take a page from the Iron Maiden handbook with a mix of tempos, smokin' lead harmony breaks as well as extended instrumental breaks. Samurai also borrows a bit of the Maiden sound with it's driving heaviness and more extended instrumental/lead breaks. A few of the songs, Smile Back At Death, Crack In The System and tha album closer Serpent Hearted Man have a bit of a modern edge with the guitar riffs yet fear not - chugging heaviness, galloping riffs and lots of thematic riff breaks/leads still dominate the arrangements of these songs. While You Were Gone, a track that he now dedicates to his wife, begins as a slow atmospheric and gut-wrenching heavy ballad before launching into a sudden speedy tempo for more lead/riff breaks and extended instrumental sections. At The End Of The Day also uses the same sort of arrangement yet substitutes the speedy tempo change with extended atmospheric lead guitar work instead. Waiting For My Life To Begin, Voice From The Past and The Truth Is Gone all feature driving metal riffs and yet more extended lead/instrumental breaks with Voices From The Past having Helloween like speedy harmonized lead guitar work. Blaze even ventures into thrash metal territory with Robot. With Dave Lombardo (Slayer) like speed drumming and thrashy speed riffs, this one sees Blaze singing in half-time over the speed, much like Slayer's Tom Araya does as well. Blaze's voice sounds a strong as ever and even though his voice may be an acquired taste for some, he has such a unique voice that its easily identifiable. You can really hear the desperation, anger and defiance in his voice throughout the album and the emotion he puts into his performance here is unlike anything I've heard from him before. This album simply grabs you by the throat right at the onset and really never lets go. No filler tracks whatsoever and you'd be hard pressed to find a better traditional sounding metal album than this one from 2008. In comparison with other big releases from '08 including Iced Earth's Crucible Of Man, Blaze Bayley's The Man Who Would Not Die rolls The Crucible Of Man into a nice tight spliff and smokes it!! !